Reason: Missing distribution text for Smeargle. This is a reverse-chronological list of event Pokémon distributions that were given away locally to German language Pokémon games in Generation V.
These Pokémon were distributed in many places around the world. At most locations they could be obtained by English, French, German, Italian, and Spanish language games. The date this Pokémon was received is determined by the date on the DS when the Wonder Card is received. Ein Schillerndes Giratina für dich! Pokémon der Sinnoh-Region ist dein! Ein Schillerndes Palkia für dich! Ein Schillerndes Dialga für dich! This Smeargle was distributed at the 2013 World Championships from August 10 to 11, 2013. On August 10, 2013 it was available from noon to 8:00 pm and on August 11, 2013 it was available from 9:00 am to 4:00 pm. It was available to English, French, German, Italian, Japanese, Korean, and Spanish language games. However, Japanese and Korean games received English versions. This Smeargle has an IV of 31 for both Attack and Speed. from August 10 to 11, 2013. Danke für deinen Besuch bei Worlds 2013! This Metagross was distributed at the Video Game Championships 2013 at the Mediolanum Forum in Milan, Italy, the RuhrCongress in Bochum, Germany, the National Exhibition Centre in Birmingham, England, and the Indiana Convention Center in Indianapolis, United States. It is based on Ray Rizzo's Metagross that was used in the 2012 World Championships. It was available to English, French, German, Italian, and Spanish language games at all locations. Auf dem Weg zum Sieg! This Meloetta was distributed in many places around the world. At all locations it could be obtained in English, French, German, Italian, and Spanish language games. 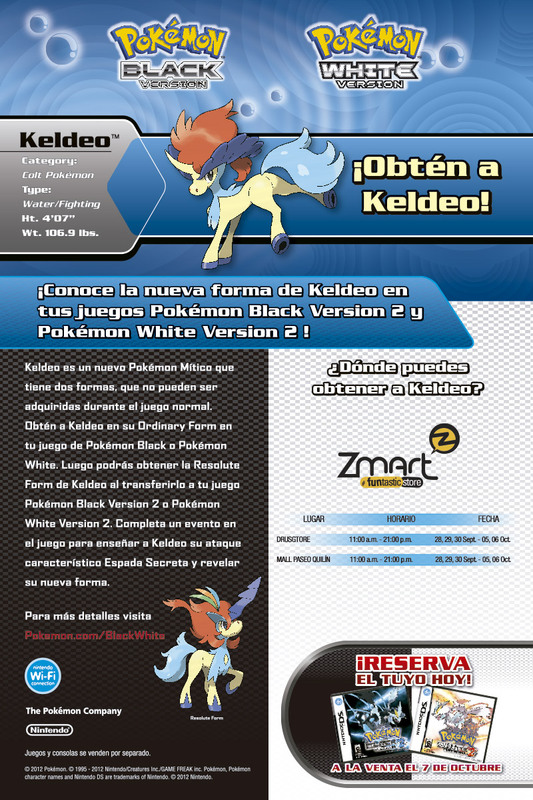 This Keldeo was distributed in many places around the world. At all locations it could obtained in English, French, German, Italian, and Spanish language games. Edition 2 auf Abenteuerreise gehst! This Pikachu was distributed at the 2012 World Championships. It was available to English, French, German, Italian, Japanese, Korean, and Spanish language games. However, Japanese and Korean games received English versions. im Kampf die Attacke Fliegen einsetzt! Danke für deinen Besuch bei Worlds 2012! In France, this Pikachu was distributed at the Japan Expo that was held in Paris from July 5 to 8, 2012. In Italy, it was distributed at Pokémon Day from July 14 to 15, 2012. In Germany, it was distributed at Pokémon Day tour stops from August 18 to September 29, 2012. At all locations it could be obtained in English, French, German, Italian, and Spanish language games. This Pokémon can be Shiny. Pokémon der stärkste Trainer von allen! This Larvitar was distributed at national finals for the 2012 World Championships. In the United Kingdom, it was distributed on March 3, 2012. In Germany, it was distributed on March 10, 2012. In France, it was distributed on March 17, 2012. In Spain, it was distributed on March 24, 2012. In Italy, it was distributed on April 1, 2012. In the United States, it was distributed from June 30 to July 1, 2012. It was available to English, French, German, Italian, and Spanish games at all locations. Freue dich auf großartige Kämpfe! This Darkrai was distributed in many places around the world. At all locations it could obtained in English, French, German, Italian, and Spanish language games. In France, this Darkrai was distributed at Toys "R" Us stores from November 14 to 26, 2011. In Switzerland, it was distributed at Softridge and GameStop stores in Zurich and Lucern from November 14 to December 31, 2011. In Germany, it was distributed at GameStop, Toys "R" Us, and Karstadt stores from November 16, 2011 to January 31, 2012. In Italy, it was distributed at the Pokémon Winter Camp each weekend in a different location from November 19 to December 18, 2011. 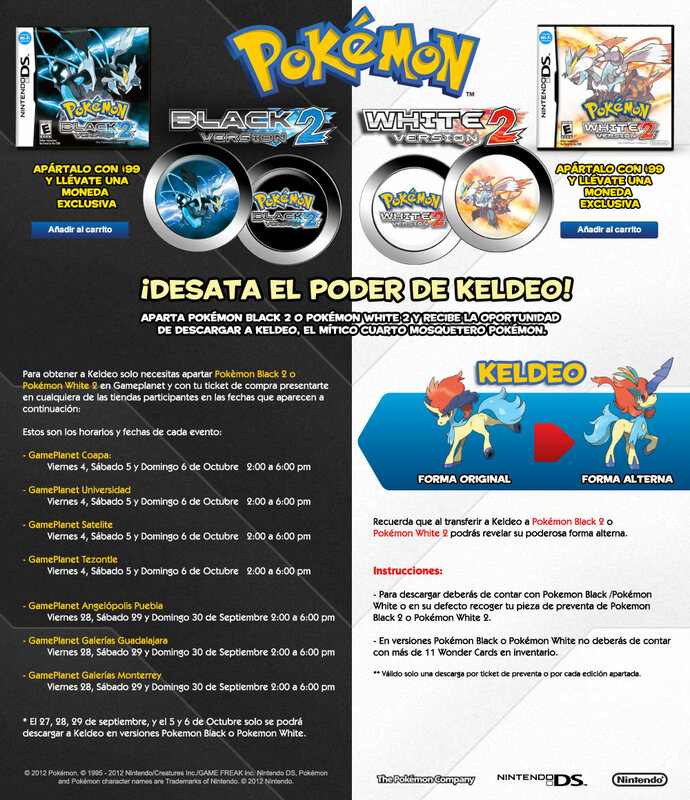 In Spain, it was distributed at GameStop stores from November 23 to December 31, 2011. In Finland, it was distributed at the finals of the Finland's Best Wii Player competition on November 26, 2011. In Greece, it was distributed at Kotsovolos stores on December 31, 2011.
das jeder kennt und fürchtet! Danke, für deinen Besuch im Geschäft! This Scrafty was distributed at the 2011 World Championships. It was available to English, French, German, Italian, Japanese, Korean, and Spanish language games. However, its language of origin is always English. This Zoroark was distributed in many places around the world. At all locations it could obtained in English, French, German, Italian, and Spanish language games. In Greece, this Zoroark was distributed at Multirama stores on June 11 and 18, 2011. In Italy, it was distributed at Pokémon Camp from July 20 to October 23, 2011, and at Pokémon Day from June 18 to 19, 2011. In France, it was distributed from June 20 to August 20, 2011 at GAME stores, and from June 30 to July 3, 2011 at the Japan Expo 12. In Switzerland, it was distributed at Softirdge stores from June 24 to August 27, 2011. In Sweden, it was distributed at Toys "R" Us and GAME stores from August 8 to 28, 2011. In Germany, it was distributed at the Pokémon Day event from August 27 to October 1, 2011. In the Netherlands, it was distributed at a playday in Hoorn on September 18, 2011. In Austria, it was distributed at Libro stores from September 22 to October 5, 2011. In Belgium, it was distributed at Cora hypermarkets on October 8, 2011. Probier sie in einem Kampf aus! ONM announces "Pokémon Adventure Camp"
This Karrablast was distributed in many places around the world. At all locations it could obtained in English, French, German, Italian, and Spanish language games. In Greece, this Karrablast was distributed at Multirama stores on June 11 and 18, 2011. In Switzerland, it was distributed at Softridge stores from June 24 to August 27, 2011. In Germany, it was distributed at Toys "R" Us and GameStop stores from June 24 to August 27, 2011. In France, it was distributed from June 30 to July 3, 2011 at the Japan Expo 12. In England, it was distributed at Pokémon Adventure Camp from July 15 to 17, 2011. In Italy, it was distributed at Pokémon Camp from July 20 to October 23, 2011, and at la Feltrinelli, GameStop, Saturn, and MediaWorld stores from July 24 to August 31, 2011. In the Netherlands, it was distributed at E-Plaza stores. Du hast ein Laukaps erhalten! This Shelmet was distributed in many places around the world. At all locations it could obtained in English, French, German, Italian, and Spanish language games. In Greece, this Shelmet was distributed at Multirama stores on June 11 and 18, 2011. In Switzerland, it was distributed at Softridge stores from June 24 to August 27, 2011. In Germany, it was distributed at Toys "R" Us and GameStop stores from June 24 to August 27, 2011. In France, it was distributed from June 30 to July 3, 2011 at the Japan Expo 12. In England, it was distributed at Pokémon Adventure Camp from July 15 to 17, 2011. In Italy, it was distributed at Pokémon Camp from July 20 to October 23, 2011, and at la Feltrinelli, GameStop, Saturn, and MediaWorld stores from July 24 to August 31, 2011. In the Netherlands, it was distributed at E-Plaza stores. Du hast ein Schnuthelm erhalten! This page was last edited on 27 February 2017, at 18:58.